Most Americans know Rev. Dr. Martin Luther King, Jr. as one of the twentieth century’s most revered voices for racial equality, the charismatic leader of the American Civil Rights movement, who gave the famous “I Have A Dream“ speech. Perhaps they even know a thing or two about his role in the Montgomery Bus Boycott and the Birmingham Campaign. This knowledge by and large derives from compulsory education and mainstream media. It is significantly less likely, however, that very many Americans know much at all, if anything, about King’s radical and controversial activities related to the issues of poverty and militarism, particularly the latter. The reasons underlying the public’s lack of awareness on King’s work in these areas is a subject for another time. King highlighted three primary forms of violence, oppression and injustice in American society and across the world: poverty, racism and militarism. 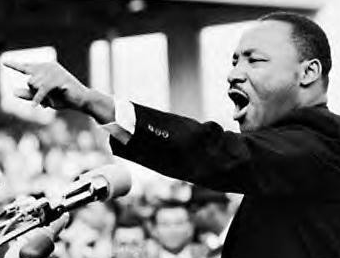 He referred to these as the “triple evils,” and considered them to be interrelated problems, existing in a vicious and intractable cycle, and standing as formidable barriers to achieving the Beloved Community, a brotherly society built upon and nurtured by love, nonviolence, peace and justice. King posited that when we resisted any one evil, we in turn weakened all evils, but that a measurable and lasting impact would require us to address all three concurrently. 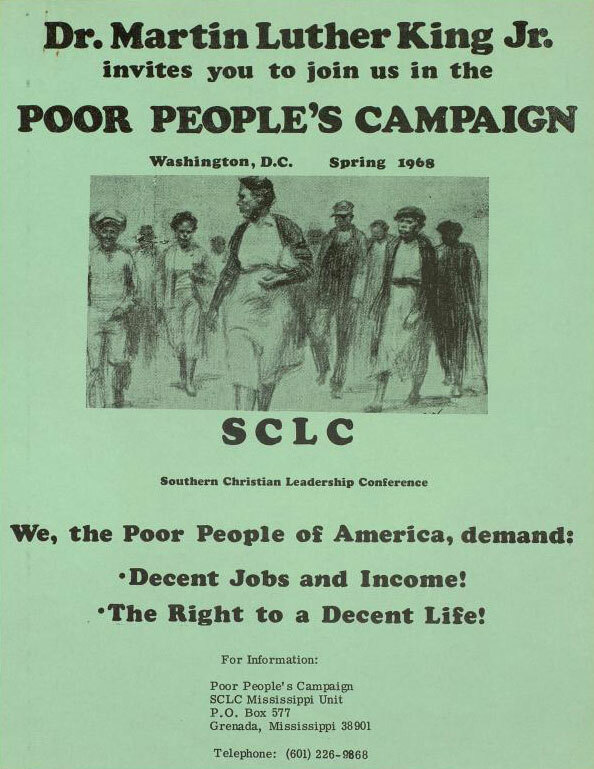 In late 1967 King announced the Poor People’s Campaign, an innovative effort designed to educate Americans on poverty issues and recruit both poor people and antipoverty activists for nonviolent social change. 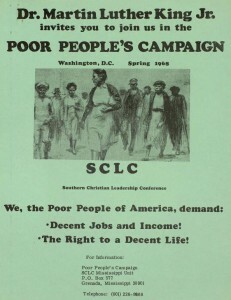 The priority of the project was to march on, and to occupy, if you will, Washington and to demand the Congress pass meaningful legislation to improve the social and economic status of the poor, through directed measures such as jobs, unemployment insurance, health care, decent homes, a fair minimum wage, and education. Alas, Dr. King was assassinated only weeks before the actual march took place. And while the march went ahead as planned in May of 1968, it is thought that the lack of substantive change to result was due in large part to King’s absence. Still, a positive outcome of the initiative was a heightened public awareness of the nation’s growing poor population. King’s most pointed speech against militarism was “Beyond Vietnam: A Time to Break Silence,” delivered at Riverside Church in NYC on April 4, 1967, a year to the day before he was assassinated. While King’s popularity among political allies and his inner circle was already beginning to wane because of his increasing public criticism of U.S. foreign policy and the growing war in Vietnam, the Beyond Vietnam speech was to become his most public dissent of the war to date, a war still largely unopposed by the majority. To speak out in opposition to the war, he acknowledged, was personally necessitated, asserting, “because my conscience leaves me no other choice.” With such a call to conscience, “a time comes when silence is betrayal.” And in the present day, argued King, “that time has come for us in relation to Vietnam.” In the speech King calls the United States “the greatest purveyor of violence in the world today” and questions why money is being spent to wage war on foreign lands against foreign people while the war on poverty at home was being neglected, financially and otherwise. The major media of the time denounced the speech and King lost a great deal of support among his colleagues and the American people for it. We owe it ourselves and our children and grandchildren, as well as our communities and nation to learn and teach about and take up King’s efforts to not only end racism but all three of the evils against which he so untiringly stood. Only then will we find ourselves closer to achieving King’s dream of the Beloved Community. A small but important step toward this goal is to volunteer, as my family and I do, with a charitable and progressive cause on the Martin Luther King, Jr. holiday, a national day of service. Brian J. Trautman is a military veteran, instructor of peace studies at Berkshire Community College in Pittsfield, MA. and a member of the Green Party. He is a peace activist involved with a number of groups, including Veterans for Peace and Berkshire Citizens for Peace and Justice. On Twitter @TrautBri.